So here’s the premise: two guys walk into a bar. More specifically, gods Hermes and Apollo visit Wheat Sheaf Tavern and after a few drinks, while not intoxicated, make a bet. Actually it first started with a conversation about the nature of humanity. Apollo felt that humans have nothing special about them. They are no better or worse than any other creature on the planet and yet feel superior. Hermes felt the opposite especially when it came to language. Is it human language and intelligence that make one superior and happier from other creatures? And so a bet was made. Apollo bet one year’s worth of service to Hermes that animals, if given human intelligence, would be even more unhappy than humans. Hermes took the bet with the condition that if even one of the creatures were happy at the end of their life, he won. And so they passed a veterinary clinic where they granted fifteen dogs human intelligence. Fifteen Dogs is a creative and fascinating apologue (a moral fable, especially one with animals as characters). Yes, I had to look it up. Especially with dogs as the narrators and characters. It reminded me a bit of Animal Farm and if you read that then you also know that there is heartbreak and violence within the pack of animals. Some of the dogs welcome the new intelligence and language into their lives and pontificate about consciousness and meaning of life. Others balk against the change and want to remain dogs with the hierarchy of dominance in tact. It’s interesting because with the book being only 170 pages it took me several days to read. The language is rich and lush with so much to digest. I compared it a bit to Animal Farm and at the same time it isn’t. The only thing they have in common is animals taking on human intelligence and language but while Animal Farm is more political, Fifteen Dogs is more philosophical, which I find intriguing. If you have a dog, you won’t look at them the same after this read but also what I need from my pets (and people) is much different from what they need and want from me. I try to remember where I first hear about books that get added to my reading shelf and believe this one was from Shannon at River City Reading. Her review started that hum in my brain. While I enjoy the comfort read time and again, I also love books that stretch my comfort zone and leave a lot to ponder. This is one of those books! 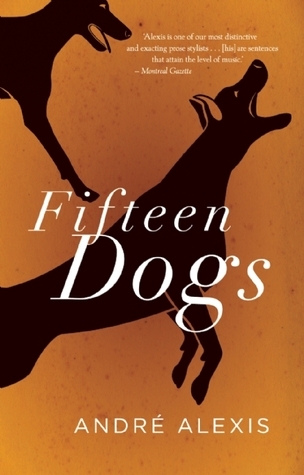 Fifteen Dogs was written by André Alexis and published in March 2015 by Coach House Books. I got a copy from the library and you can check WorldCat for a copy in your area. Tags: Andre Alexis, apologue, Coach House Books, Fifteen Dogs. Bookmark the permalink. Seriously…it’s a great opening scene! So glad to hear you enjoyed it! It really is such a unique book, I don’t think I’ve read anything like it and I’m still thinking about it a month later. Aside from the story, wasn’t his writing unbelievable?! I must check out his other work. It was a slow read for me because the language was so lush. I wanted to slow down and savor the words. Really great! What a concept and his writing is gorgeous. Me too on the “Shannon got this book on my radar” train! I’m planning to give it a shot sometime this year…even though it’s definitely out of my comfort zone!